THE PHENOMENA OF ENCOURAGEMENT. IN CONVERSATION WITH PAWEŁ ALTHAMER. 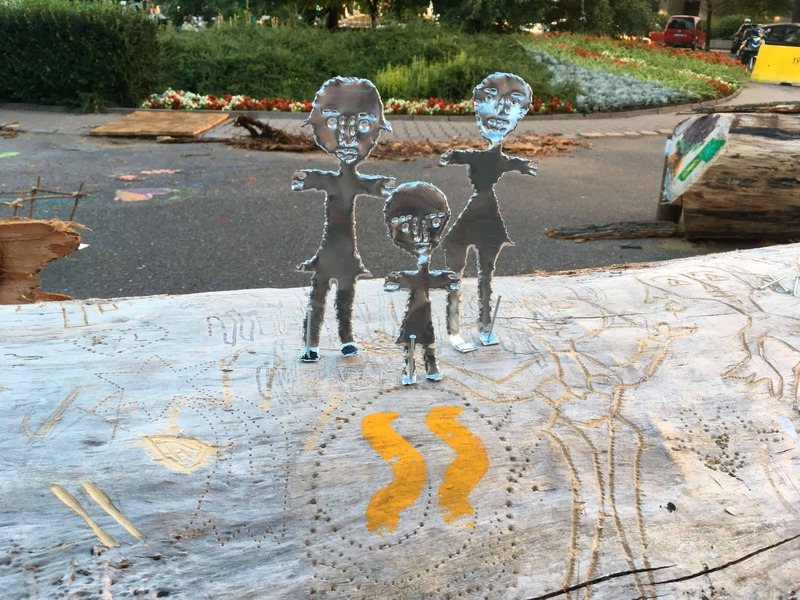 I’m meeting with Paweł Althamer in front of the Zachęta National Gallery of Art in Warsaw, where his newest participatory project Windbreakers 2018 takes place. The project is done in collaboration with Roman Stańczak, an artist and Althamer’s longtime friend. 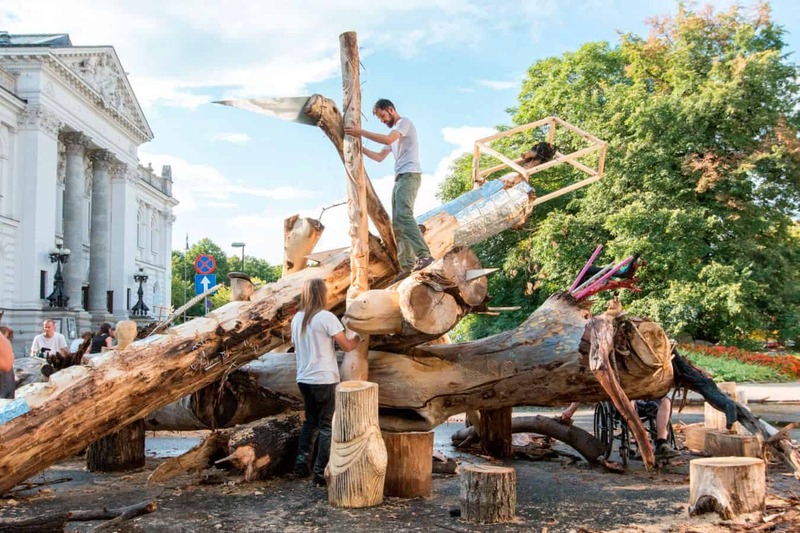 Windbreakers 2018 is an open-air workshop, aiming to create a social sculpture using the trees that have fallen during the devastating May storms in Poland. Paweł Althamer, Windbreakers 2018. Photo by Jacek Markiewicz. To participate in this project, Althamer invited other artists, his friends, former students and some members of the Nowolipie Group, with whom he started collaborating over twenty years ago. The Nowolipie Group is a Warsaw-based organisation for adults suffering from multiple sclerosis, mental or physical disabilities. Works created by its members together with Althamer were shown in New York, Moscow, Miami, Warsaw and London. When I asked Althamer, what is it in the people from the Nowolipie Group, that made that collaboration last for so long, he simply said that working with them gives him huge satisfaction. He saw something special in these people. He saw something pioneering and inventive in their vulnerability, which was a result of doing things for the first time. It was the joy from everything new and surprising, that brought them together and now, after more than two decades have passed, Althamer admits that even when he is working alone, he has the feeling that he is working with the group. Paweł Althamer, Roman Stańczak and guests. Windbreakers 2018. Photo by Weronika Wysocka. Courtesy of Zachęta National Gallery of Art. When Althamer arrives at the workshop everyone stops what they are doing and comes to greet him. He tells me that he is like a nuclear power station, generating energy with the help of others – “It works, I’m collecting the evidence”, he assures me. People need encouragement. They are quite demotivated these days. Demotivated to life and to themselves. He is here to change it. The word ‘Zachęta’ in Polish means encouragement. Althamer, invited by Zachęta National Gallery of Art to do the project, encourages us to think about the present moment. Through Windbreakers 2018 he promotes the phenomena of encouragement. He encourages the viewers and participants to experience beauty in others, themselves and the common space. Everyone is invited – people from nearby restaurants, companies and even ordinary passers-by. When woman dressed in high-heeled shoes and corporate uniform asks if she can join, someone immediately passes her a piece of wood, so she can start to sculpt with others. When a man with his own piece of tree comes and wants to work alongside Althamer, he does so a few minutes later. Paweł Althamer, Roman Stańczak and guests. Windbreakers 2018. Photo by Jacek Markiewicz. People watching the workshops from a distance are entranced. They are observing the artists at work, whilst wooden shavings are flying, and the drills are working at the top speed. Some of them are taking photos, others come closer and start to talk with artists. Everyone is equal. Althamer sculpts and answers my questions. Someone shouts in the background “Paweł, where is the drill?”. He gives instructions where to find it. At one point he tells me, that after all these years he learned how to find joy in doing nothing, in being inactive at times. Although it’s hard to take him at his word, as he started to sculpt a few minutes after his arrival at the workshop and agreed to do the interview at the same time. When asked to expand upon these words, Althamer explained to me that now he can look at his past from today’s perspective and simply enjoy it. However, it’s not the past that is important here. What is important is here and now and Althamer’s projects seem to resonate these words, reminding us that sometimes making art should simply bring joy. Not only to the artists but also to the viewers.